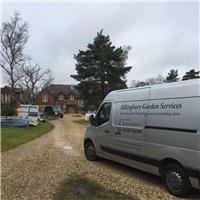 Hiltingbury Garden Services (HGS) is a partnership company between two friends based in Chandler's Ford. We pride ourselves on professionalism, integrity, fairness and honesty; believing in excellence and continually striving to achieve above expectations. HGS cater their work around each customer's requirements, needs and budget. We take great gratification on being flexible and offering sound advice; customer service and satisfaction are very important to us. We offer an extensive range of services which include all aspects of landscaping, garden regeneration, paving, fencing, turfing, pruning, hedging, lawn care and maintenance packages which use top products available on the market. We can source architectural and specimen trees, shrubs and plants for those really special projects through some of the finest purveyors in horticulture. Please contact us if you require any advice, we are happy to discuss your requirements and accommodate to the highest standards. We are based in Chandler's Ford and cover work in and around the following area's: Winchester, Southampton, Romsey, New Forest.